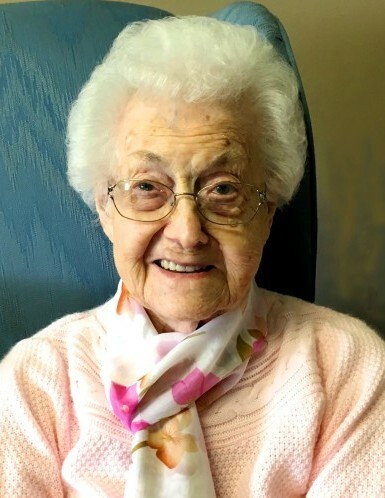 Irene Schamber, age 106, passed away on Monday, January 28, 2019 at Lutheran Life Village in Fort Wayne. Mrs. Schamber was born December 11, 1912 in rural Wisner, Nebraska to Gerhardt and Adeline (Stalling) Schutte. She received her early education in a one-room schoolhouse, graduated from Wisner High School in 1930, and taught in Cuming County for four years. In 1935, she was married to Herold Schamber of Fremont, South Dakota. They were the parents of two sons, John and Frederick. They lived in rural Clarinda, Iowa from 1945 – 1954 and then moved to Lakefield, Minnesota. They retired in 1972 to Fremont, Nebraska where Herold passed away in 1992. Irene left Fremont in 2001 to be nearer to her family and became a resident at Lutheran Life Village in Fort Wayne, Indiana. Irene enjoyed the independent living at Lutheran Life Village which continued into assisted living and finally to skilled nursing before she passed away. She touched many lives with her gentle and caring ways along with her unwavering faith. Baptized as an infant, she was a life-long member of the Lutheran Church. Son, John and Brenda Schamber of Fort Wayne. Son, Frederick and Julie Schamber of Murrysville, Pennsylvania. Five grandchildren, eight great grandchildren and three great-great grandchildren. Funeral services will be held Friday, February 1, 2019 at 2:00 PM at Lutheran Life Village, 6701 South Anthony Blvd, Fort Wayne, Indiana with visitation at 1:00 PM. Pastor Mark Neubacker and Pastor Mike Wakeland will officiate the funeral service. Burial will take place at a later date in Fremont, Nebraska. Memorial donations may be made to Orphan Grain Train, Norfolk, Nebraska or Lutheran Life Village, Fort Wayne.